In 1974 Sir Arthur C Clarke, science fiction writer and futurist, predicted that in the future there would be universal use of the Personal Computer (PC). This was fairly remarkable at the time since the PC didn’t actually exist and the only computer worthy of the name was the size of Hyde Park and needed an even larger hangar to house it. Now some say that this prediction wasn’t all that difficult since the computer had already been invented and all he was actually doing was predicting that it was going to become smaller and more user friendly. Struth mate, his Australian critics exclaim, any Pom worth his salt could have seen that one coming! But, it is my duty to inform you, Clarke didn’t stop there. No siree. He also accurately and without any precedent to go on foresaw the wide adoption of email as a communications medium, the internet and even on-line home banking, would you believe? Now c’mon you sceptics one and all, that really was something to forecast forty years ago when post-it notes were all the rage as the very latest one-to-one medium of choice. But the same seer-knockers then turn their unwanted attention to the late great Steve Jobs of Apple. What!, they cry in unison, did Jobs ever invent that hadn’t already been invented? They cite the iPod as their example. The Sony Walkman was in daily use as a personal music player so all that Stevie baby did was to make it more aesthetically appealing, digital and smaller. No mean feats of course but the Jobs’s naysayers are not easily impressed. No siree. In my role as an educational technology specialist and provider I’m often asked where I see classroom technology going in the future and although I don’t claim to be a seer like Arthur C Clarke, I can make some qualified predictions based on where we are at present. For classroom hardware I see little change from the interactive flat panels that many schools are already installing to replace conventional IWBs with projectors. These IFPDs, as they are known, are today practically as good as they need to get. 4K resolution, high definition, multi-touch screens all increasingly in use in classrooms right now. What’s not to like? In the future, possibly we could introduce 3D but the downside is the glasses. No teacher wants to face a classroom of pupils all wearing men-in-black shades. That won’t work. Probably screen sizes will extend beyond the current largest and IFPDs may follow the screen curvature lead of the latest consumer LED televisions. But all in all, schools installing IFPDs today are future-proofing their classrooms and can look forward to many years of cutting-edge use. For software the future is equally bright and bountiful. Already there is huge choice presented to teachers covering general, specialist, subject, special needs, gaming, quizzes and lots more. Every week very clever people launch new and exciting software and apps for use on multi-touch screens so for those teachers who do their research for software to use with their classroom tech to enhance and support their lessons are hugely spoilt for choice. The future holds a lot more of the same as software becomes more intuitive, increasingly interactive and able to be customised to users’ desires. It’s all good news. But ask me to look 40 years ahead as Arthur C Clarke did, I really would have to pass. That’s just one big ask too far. Yes siree. 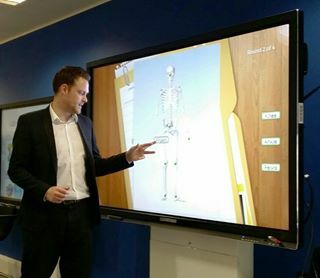 To view the very latest in cutting-edge classroom tech, click on the CleverTouch LED tab at the top of this page.